Companies have previously tried blocking the use of co-pay coupons for certain medications and at certain pharmacies. But the latest approaches have taken a very different tack by instead taking advantage of the coupons, just not to the benefit of consumer out-of-pocket costs. 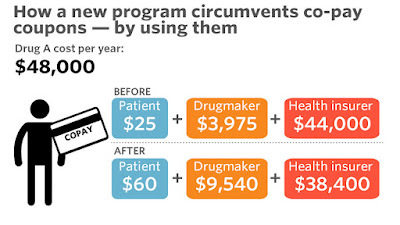 New programs offered by pharmacy benefit managers seem poised to take off industry-wide. The most promising program targets high-cost specialty drugs, using the co-pay coupon to offset the drug’s total cost instead of the consumer’s co-pay. Pharmacy-benefit managers are able to do this, and to offer the program for free, by requiring that health plans exclusively deal with a certain specialty drug pharmacy. Before the program, a patient using a coupon would very quickly meet her health plan’s out-of-pocket requirements, at which point the coupon would no longer be necessary. Under the change, however, the coupon could be used many more times and the patient would pay more out of pocket, making the co-pay coupon more expensive for the drug maker and reducing the health plan’s total drug costs by an estimated 1% to 3%. Prime Therapeutics, a pharmacy-benefit manager owned by 14 Blue Cross and Blue Shield plans, began rolling out such a program at the start of this year across several states, according to Chief Clinical Officer David Lassen. Koulianos, of the National Hemophilia Foundation, said that she knows of about 50 people affected, and that the number is growing. “While we agree that this is in theory a good mechanism to help patients consider, ‘I better take the lower-cost drug’… in this case there is no lower-cost drug,” she said. If patients can’t afford their medications, they could end up in the hospital, or worse, she said. Another new co-pay coupon-circumvention program has a similar goal — taking advantage of drug makers’ coupons — but approaches it differently. The manufacturer coupons are often valued at far more each year or per drug than patients pay out of pocket. So pharmacy-benefit managers adjust the co-pay amount patients pay for certain drugs up to coupon thresholds, to take advantage of the coupon’s total possible value. Only certain drugs will be affected, with expensive cancer and hepatitis C drugs likely targeted, amounting to estimated drug-cost savings of 2% to 4%. But because the program requires making changes to a health plan, it’s expected to have reduced or limited interest. It also raises questions about how those who don’t use co-pay coupons might be affected.